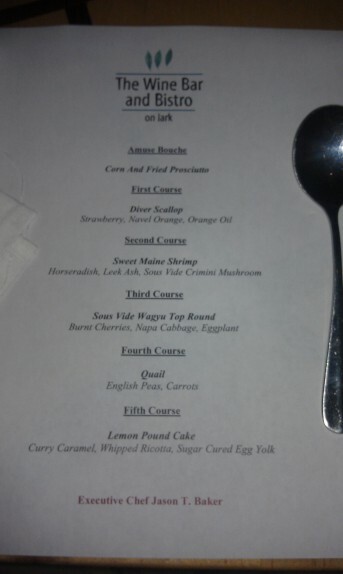 I wanted to do something big and low key for my birthday this year, so I decided early on in July that I’d call the Wine Bar and Bistro on Lark, which normally doesn’t take reservations, to arrange a special five course chef’s tasting dinner, advertised as $70 per person. 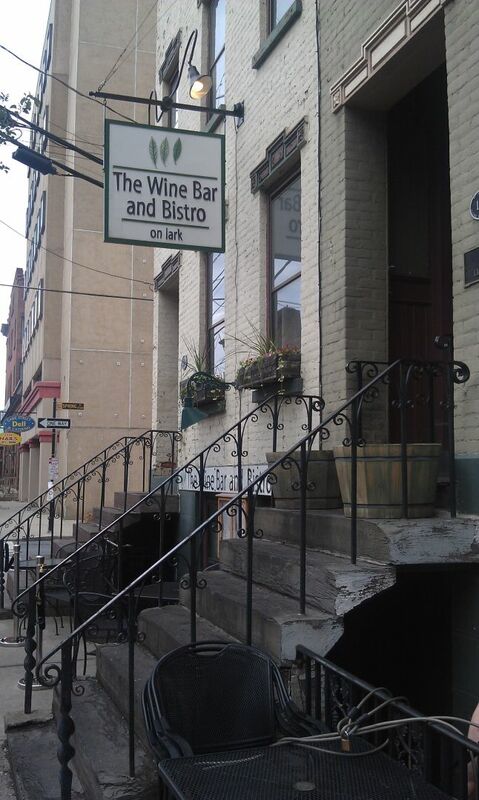 Days after I set up my reservation, Steve Barnes broke the news that Jason Baker was leaving the Wine Bar on Lark to work for Adventures in Food Trading, a place I’ve written about in the past and that I frequent for some culinary staples. I guess that’s good timing! My first experience with Wine Bar on Lark was overwhelmingly positive, and I make it a point to stop in for dinner whenever I want a meal that I know will leave the kitchen with high standards. Once we arrived, we were greeted by proprietor, Chef Kevin Everleth. It’s always great to chat with Kevin. 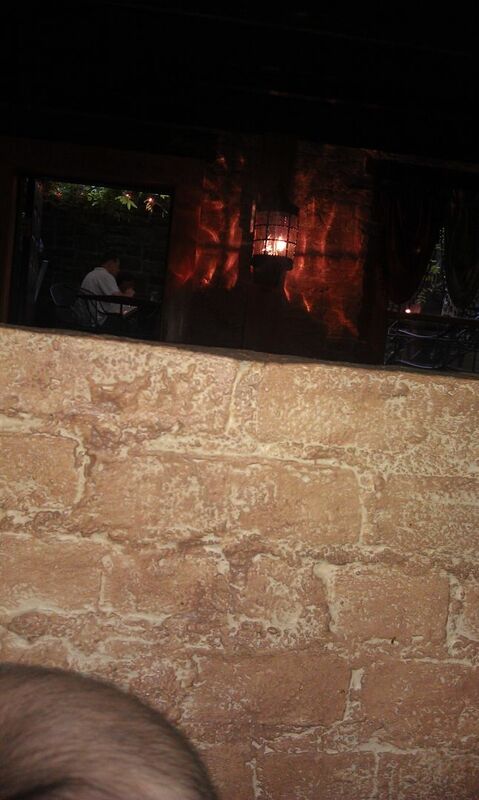 A young lady sat us at our table, which was the infamous “makeout booth” on this evening. I guess it’s gained this notoriety because of the configuration of the two seats in the booth; the two seats are 90 degrees apart from one another, and it’s pretty easy to lean in for a kiss. We tried, tastefully, of course; it’s a public place, for God’s sake! The menu was waiting for us at the table. We were promptly greeted at the table by Jonathan, who would be guiding us through the meal be bringing me wine; I decided to do the additional wine pairing with each course for a meager $25 (Cassie didn’t since she was driving, but she tried a couple of the selections along the way). 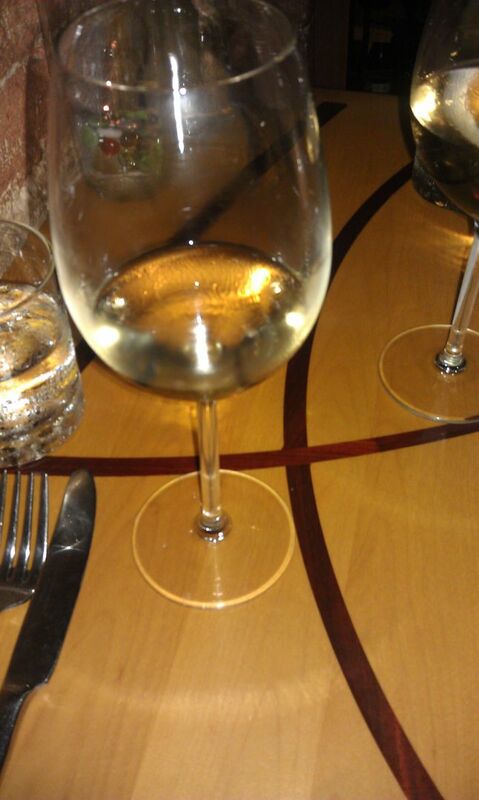 He brought both of us a sparking wine, Finea Raventos Cava Brut Rose from Spain. 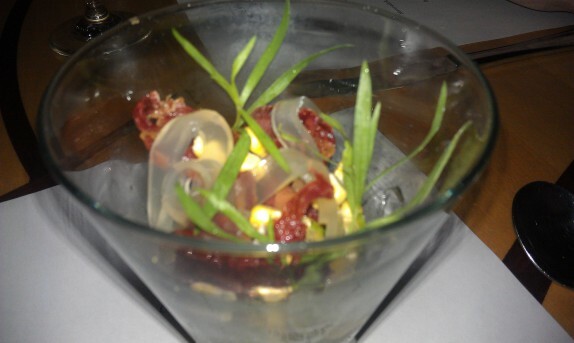 He told us it would pair well with the Amuse Bouche, which was corn and fried proscuitto. I have to be completely honest. When I read “fried proscuitto,” I became skeptical of the dish. I’ve seldom enjoyed proscuitto cooked into any dish. But, as I ate this, I really thought it worked. By frying the proscuitto, the result was a crunchy and lightly flavored bite. When taken with the fresh corn kim chee, freeze dried corn, corn gelee, and tarragon, the proscuitto fit in there perfectly. It was only a couple of bites, but it was simple, refreshing, and texturally interesting. 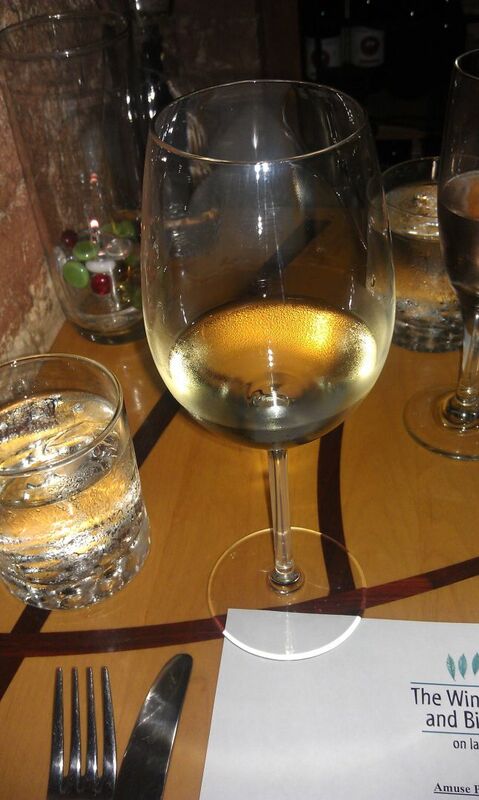 Before the next course came, Jonathan brought a glass of 2011 Abbazia di Novacella Kerner from Alto Adige, Italy. This wine was good. The aromas were much stronger than the taste, and it wasn’t either too sweet or too dry. 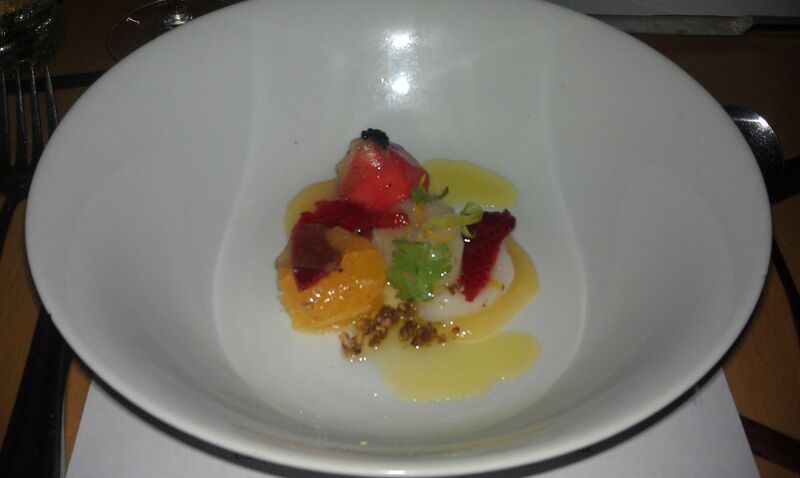 It actually worked well with the first course, Diver Scallop with strawberry, navel orange, and orange oil. 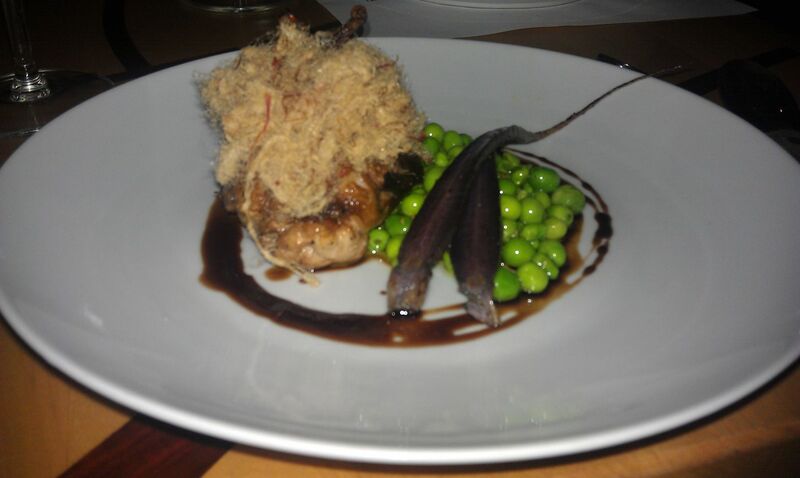 This was a very interesting dish. The scallop was served raw, and the strawberry was peeled, and the “skins” were prepared differently from the main fruit. 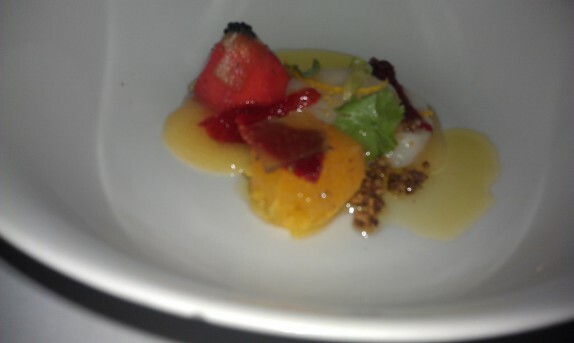 There was a bit of some rich caviar on top of the strawberry, and a little bit of granola was on the plate. Taken together, this was a very good course. The citrus was a little strong, and I think that’s intentional because people don’t decide to add orange oil to things so that it doesn’t taste like orange. The next wine was 2010 Lioco Chardonnay from Sonoma, Ca. 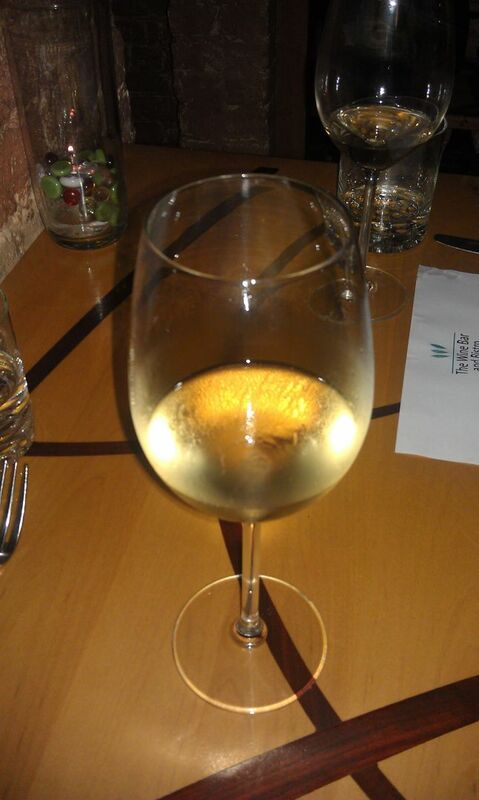 I’m not particularly a fan of chardonnay, and this wine didn’t do much to turn my opinion around, but it wasn’t bad. It didn’t work against the next course, Sweet Maine Shrimp with horseradish, leek ash, and sous vide crimin mushroom. The presentation of this dish was more playful than the last. The flavors and textures really played off of one another well in this dish. I felt like the leek ash was a little much in some bites, and that the horseradish was very subtle. The crimini mushrooms were probably the most interesting thing on the dish; the texture of a sous vide mushroom is completely different than anything I’ve ever tasted. The fun part of this dish was the snifter of mushroom consomme that was brought to the table along with the dish by Chef Baker. And after each bite, taking a sip of the rich and earthy consomme tied the flavors together; it also helped to distribute the seasoning. I felt that what was on the plate was highly seasoned, but a sip of the consomme toned that down and lightened up the taste buds. 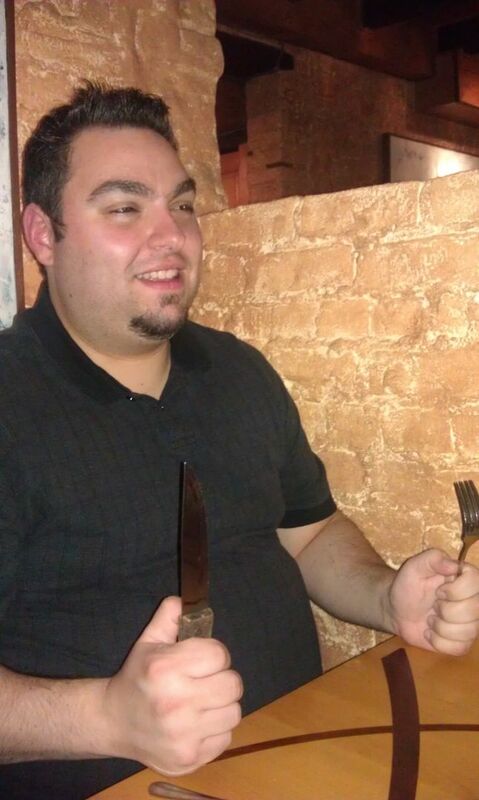 And I always do this when people bring me out a steak knife. The next wine was 2010 Odftell Vineyards “orzada” Carmenere from Maule Valle, Chile. This wine was really interesting and is one I’d like to revisit in the future. It was rich and had much spice in the aroma. It was a fair bit dry and had body. 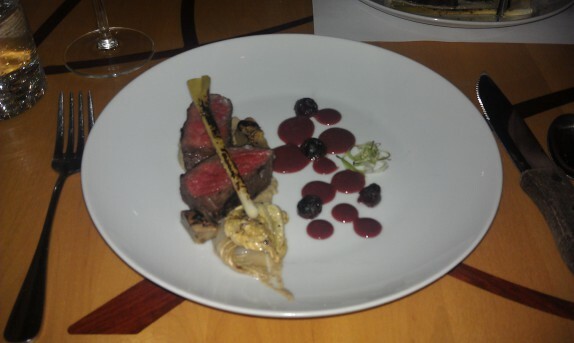 From tasting it, I knew it would work well with the beef course, which was described as Sous Vide Wagyu Top Round with burnt cherries, Napa cabbage, and eggplant. The eggplant was served as a puree under the beef and some of the flesh was served along side. 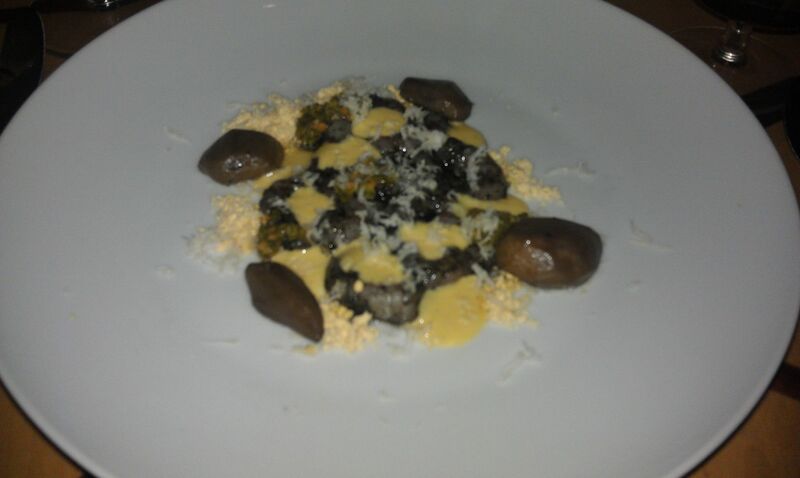 There were lots of textures in this dish, and, sad to say, I think it was the weakest of the evening. The top round was tough, which I kind of expected, but I wouldn’t think it could become that tough by being sous vide. 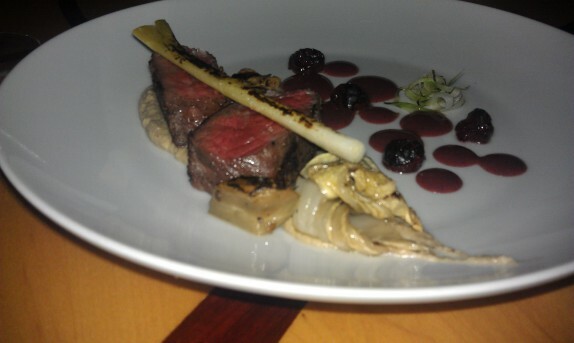 The flavor of the beef was very prominent and good, and it worked nicely with the burnt cherry and cherry puree, charred leek, and eggplant. The cabbage felt a little out of place but was cooked and seasoned nicely. Everything on the plate was nicely seasoned; it’s obvious that Chef Baker has studied and gotten to know each ingredient. 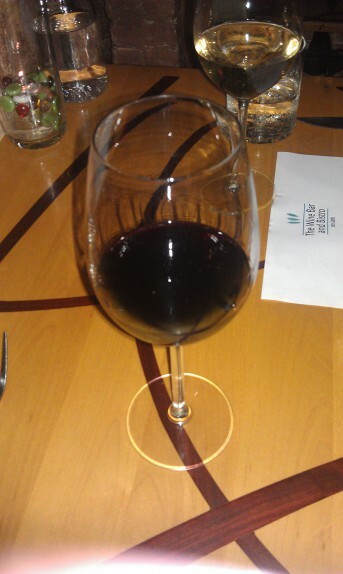 The fifth course was also served with a red wine. 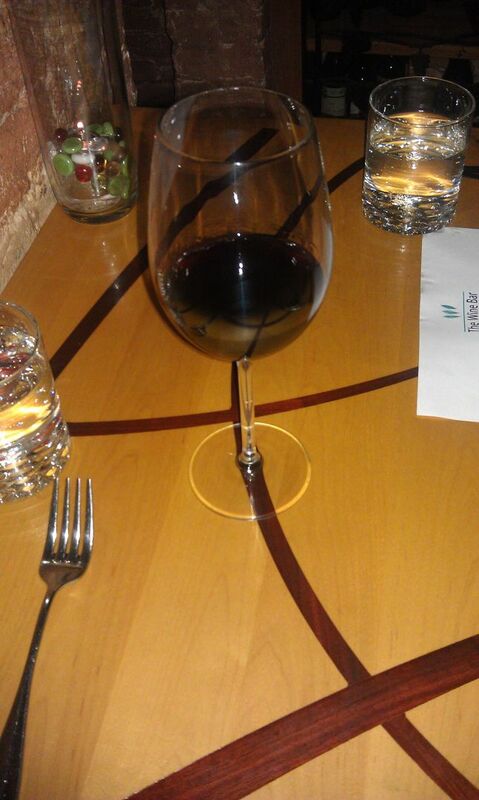 This one was 2009 Argiolas Costera Cannonau from Sardegna, Italy. I didn’t enjoy this wine as much, but I thought it was an interesting pairing with the course, Quail with English peas and carrots. This dish was visually stunning! 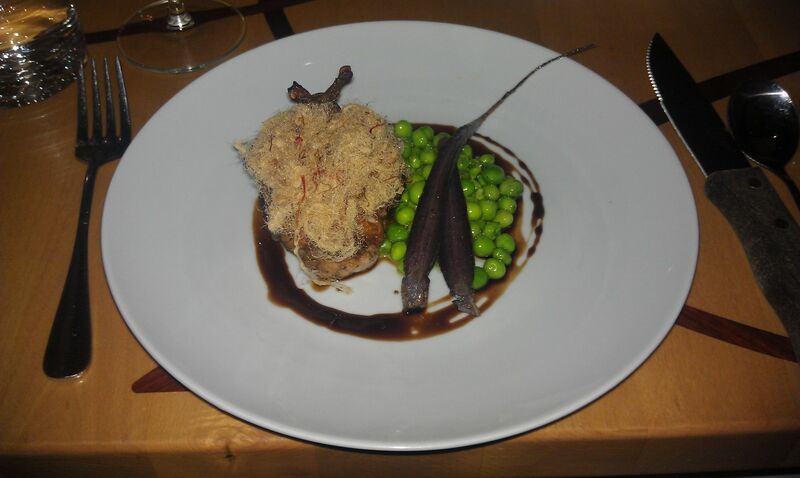 The quail was (mostly) deboned and stuffed with foie gras. It was topped with what was described as “pork fu,” which is an Asian ingredient that’s basically pork spun like cotton candy. The peas were very lightly blanched, and the carrot was barely cooked just right. A drizzle of a balsamic sauce rounded out the plate. The next wine totally blew my mind. This wine, 2011 La Spinetta Moscato D’Asti from Piedmonte, Italy, defines the form of Moscato D’Asti, and may very well be the best wine I’ve ever tasted. It’s a very sweet and in your face wine that playfully bubbles as it hits your tongue, but the balance in this particular glass of wine was uncanny. Cassie had a glass of this and she agreed that it was something special. Of course, it was being paired with the dessert course, which had the most elaborate description, Lemon pound cake with curry caramel, whipped ricotta, and sugar cured egg yolk. I had to look at this dish from multiple angles. I had to clarify with Jonathan that the pound cake was made in house, and it was (I know they like to deal with Crisan or The Placid Baker from time to time.). The dish was rich and sweet but still had some semblance of being light. 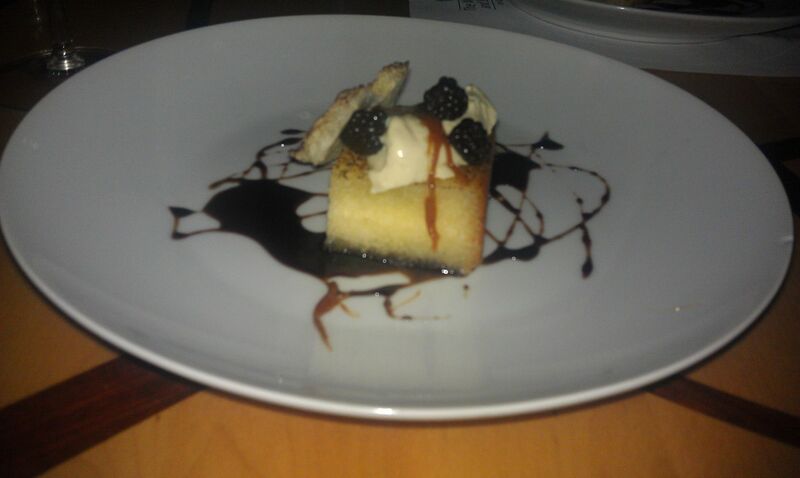 The pound cake and ricotta melted on the tongue, and the caramel helped to bring some bold flavor. The caramel was chewy and tough against the pound cake and ricotta, but the taste was divine. 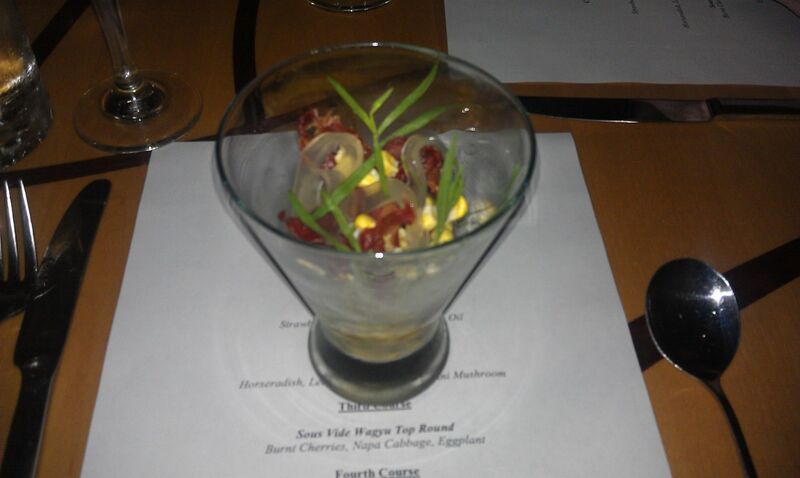 Out of all of the courses, I enjoyed this the most, and the wine really helped to elevate it beyond greatness. After the meal, I let Jonathan know that he did a great job and mentioned how great that last wine was. Chef Baker also came out to find out if I was going to be blogging the meal and to give some closing statements, including some details about what he’ll be doing with Adventures in Food Trading. 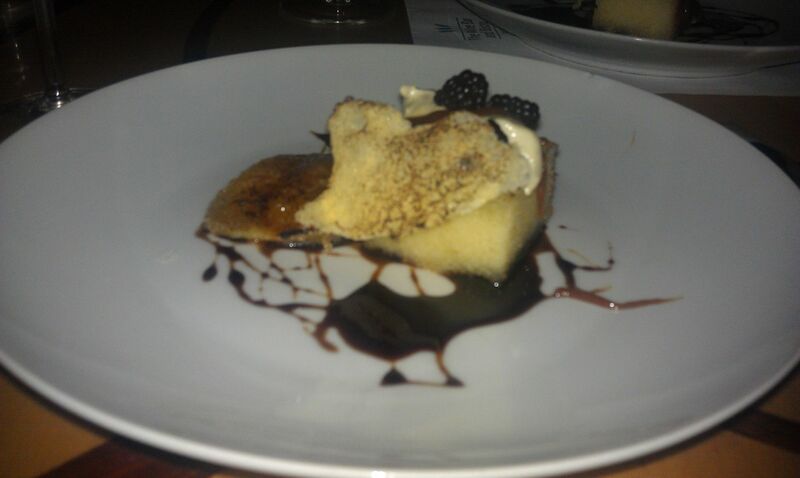 I made it a point to reiterate that the meal was very good, but that the dessert was amazing. The meal was a special memory in a special place for me. I am sure that things at the Wine bar will continue to constantly evolve and that Chef Everleth and his staff will continue to contribute to elevating the food culture in Albany after Chef Baker’s departure. And I’m definitely going back for that wine! Nice write-up! It’s such a great menu. We didn’t get the consomme with the mushroom, shrimp and leek ash dish. I felt that was the weakest dish, but I bet that consomme would’ve tied it together nicely. For me, the leek ash created a dryness in my mouth that ended up highlighting the rubbery texture of the mushrooms and the shrimp. 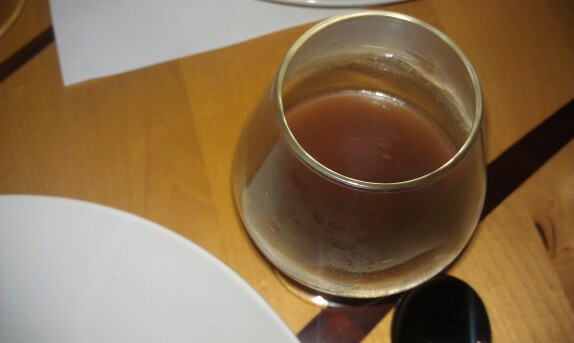 While the flavors were good, the texture left a lot to be desired – that consomme would’ve definitely made a difference. I did find that Moscato at the wine shop next to the Hannaford Plaza on Wolf (nearly across from TJ’s ground zero). They had one small bottle left which I purchased. The gentleman who runs the store recommended a different Moscato based on my interest in the La Spinetta. I have both bottles which I plan to drink with my sister in Illinois later this month to celebrate her birthday (Moscato is her wine of choice). If you are looking to pick up a bottle for yourself, though, that wine shop may be the place to visit. The gentlemen there with the French accent is very knowledgeable; it was my first time at that shop and I’ll definitely be back – excellent selection and good prices. My wife and I did the exact same tasting menu, only Jonathan paired some different wines, except for dessert which was the same. Sounds like we had similar experiences although in the end we preferred the beef over the quail dish. 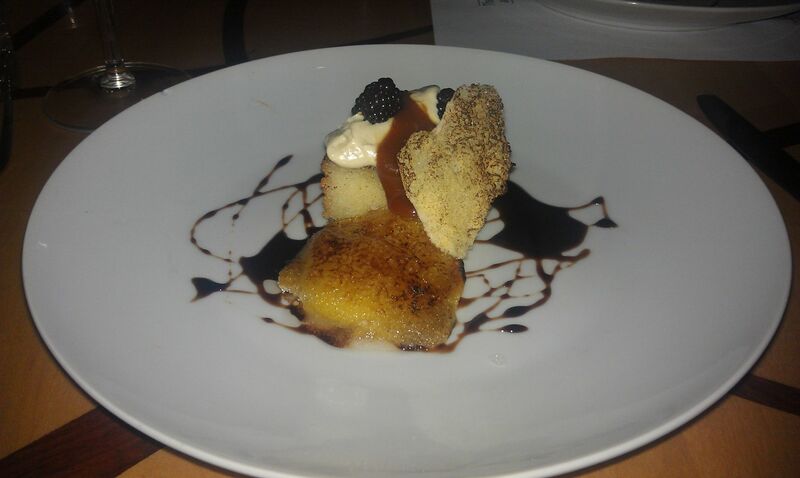 We were totally blown away by dessert – both the dish and the wine pairing, by far our favorite of the night as well. Second tasting menu we have had with Chef Baker, and though less extravagant than the 12 course meal we had in Greenwich, it did not disappoint. Best of luck Chef!